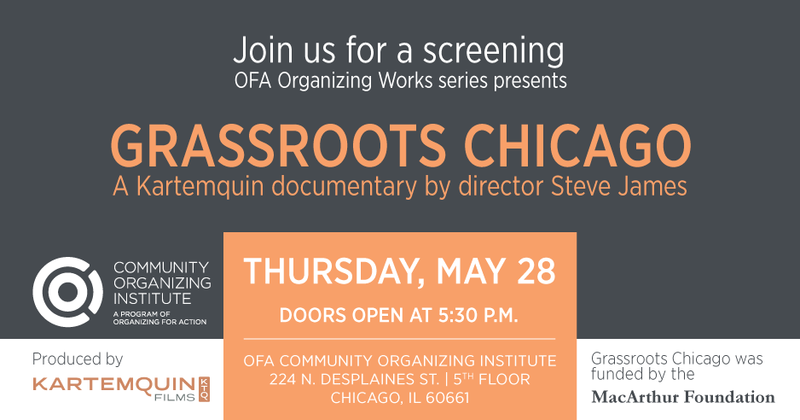 In a rare public screening, Grassroots Chicago will screen as the third event of the Organizing for Action (OFA) Community Organizing Institute's Organizing Works series, a look at the successes and challenges of community organizing through the lens of history. The screening takes place on May 28th at 5:30pm at OFA HQ in Chicago. OFA will also screen the film online to several affiliate offices nationwide. This 30-minute Kartemquin documentary from 1991 - the debut of Life Itself and Hoop Dreams director Steve James - tells the story of the vibrancy of grassroots organizing in Chicago and how community groups in the city work for social change. Originally produced for the MacArthur Foundation by Gordon Quinn and Jerry Blumenthal, this piece features six vignettes on community organizing in different Chicago neighborhoods: LeClaire Courts, Marquette Park, Roseland, Pilsen, Uptown, Rogers Park, and Garfield Park. The screening will be followed by an in-depth conversation with a panel of active Chicago organizers.